Found this tagged toilet roll today. Immediacy and brutality are the key words here. More elaborate piceces of graffiti from all over the world can be found on the Art Crimes / graffiti.org website. 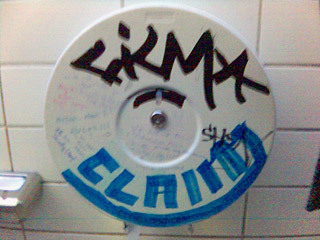 The crudeness, directness & presence of these tags made a nice contrast with the clean, cold interior of the toilet. Found near Mechelen, on the A1 highway. Voorwaar zeer elegant en overzichtelijk, waarde confrator.